I borrowed the center of the art exhibit project I have been working on (which is finished and shipped off!) to make this project. I thought it was a fun a design and I wanted to have it as a "memory" of the art project for my stack of crewel squares I am making. What I like best is that it's pretty far away from what you think of when you think of "crewel embroidery". It's still a fairly tame subject, but who knows what is coming next!! This fall I am doing a fall blog tour of embroidery blogs. I send off questions to the keeper of the blog and get permission to post a few pictures of their work. I plan to do this up until Christmas, at least 1 a week. Maybe a few more, 12 is a nice number to aim for, so that is my goal! Each entry will have a list the full list of blogs in the stops, so I will go back and add them to earlier stops. I don't have all the stops planned out yet, but if you are interested in being a stop, I will entertain requests! The next stop on The Floss Box Fall 2012 blog tour is Sew in Love by Elizabeth. I've been a fan of Elizabeth for a long time now. 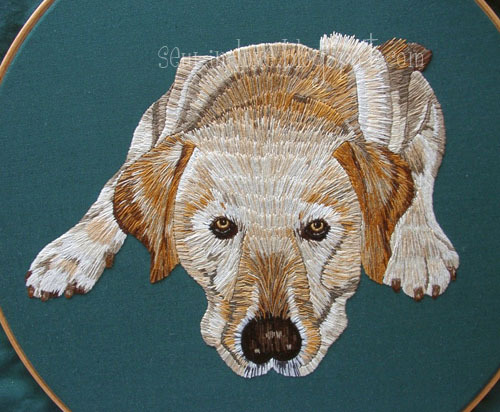 She does a variety of lovely embroidery. Be sure to visit and follow her progress. She also has a number of useful tutorials on her blog. I remember doing some embroidery as a child and even entering one piece as part of my art GCSE exam at age 16 back in 1988, but then I didn’t really do much with a needle for the next decade or more – except working about two thirds of a printed canvas needlepoint in my mid-20s. I restarted in about 2002 so, about 10 years now. 2. Why did you start? I was stuck at home all day with Chronic Fatigue Syndrome/ME and wanted something to do. An old Taiwanese friend had arranged for some of her UK magazine subscriptions to be sent via my home and amongst them were several cross stitch magazines. I flicked through them and thought, ‘I could do this!’ I got hold of some Aida fabric scraps and some old floss from my mum and made a start. Stitching was great therapy as it kept me positively and creatively busy, so I had no time to fall into the common traps of doing too much health research or feeling sorry for myself. Also, as most of the pieces I created were given to others, it kept me as an active part of my own social circle – something that many people who are ill at home feel the lack of. 3. How did you learn? I started off following the instructions in one of the cross stitch magazines. Not long after that, I went to my first needlecrafts show and bought a few kits and discovered styles like hardanger– especially at the New Stitches stand and through their Stitch Direct catalogue. I ordered some materials and moved on to learning hardanger. Soon afterwards and with the help of some books I was beginning to buy, I started out with a small freestyle piece. I’ve learned many techniques from books, kits and magazines. Some I follow to the letter – especially in the early stages of any new technique, and some I adapt freely to my own tastes. I also learned to branch out into more adventurous work by taking some City & Guilds classes in 2008/9. I wasn’t able to finish the course owing to more health troubles and moving abroad for a year, but I learned a lot just the same, not the least of which being not to shy away from more contemporary techniques. I feel I have a much broader range of skills and styles to choose from thanks to those few months of classes! 4. Which are your favourites projects? 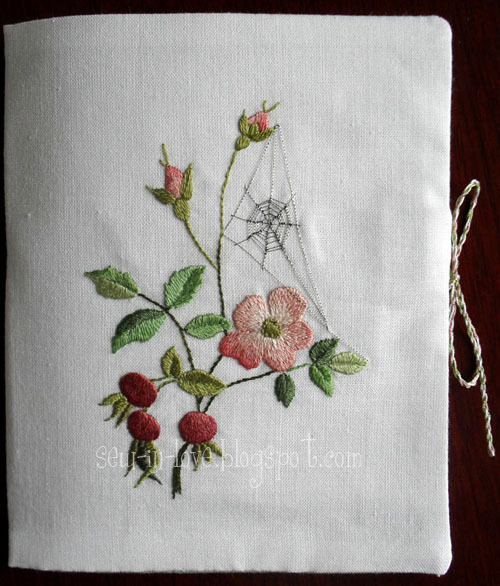 I particularly enjoyed an old Royal School of Needlework (RSN) kit which was my first exploration into raised embroidery. It was supposed to be a pincushion, but I couldn’t imagine anyone wanting to stick pins into and ruin such a lovely piece! It was made as a wedding ring cushion for friends’ wedding but, sadly, didn’t make it in time – two weeks from Britain to Ireland - crazy! Still, it made quite an unusual gift for them and I later did another small cushion as a wedding gift, this time as a small heart. Possibly the most unusual piece was an stylised tree I designed and stitched to be mounted in a large card as a leaving card on behalf of the whole department when a former manager left. Hanging off each of the branches was something to do with his life, from the county he was born to the one we were living in at the time, characters from the various languages taught in the Language Centre we worked in and what I knew of his hobbies and sports. I was even able to use one or two stumpwork techniques on it, which was a bonus for me as the designer. The chap was thrilled to bits with it and even mentioned it again well over 3 years later when our paths briefly re-crossed. I asked my husband this question as well and he mentioned some of the cards I’ve done for him, especially a wild strawberry heart I did for our tenth anniversary back in 2009. 5. What do you do with all your finished projects? Most are given away as gifts. In fact, most are intended for the person concerned before I even start (or buy, sometimes) the design! I work better with an aim in mind and, if possible, a deadline. As my husband often says, a deadline is a great motivator!! There have been several wedding gifts, anniversary things and so on. I’ve also done numerous small pieces for greetings cards (more than 80 so far) and others made into things like bookmarks, needlecases, cushion covers, a manicure case and even a key ring fob as part of an anniversary gift to my husband. He also has a small collection of cards for anniversaries and graduations – he seems to collect degrees like some people do postcards!! We also have some of the cross stitched pictures that I’ve done hanging up at home and, at time of writing, we’re in the process of framing a number of other things ready to go up. I take care of stretching and lacing the piece over a board and Sir takes care of any cutting needed for the mount and putting it all together. 6. 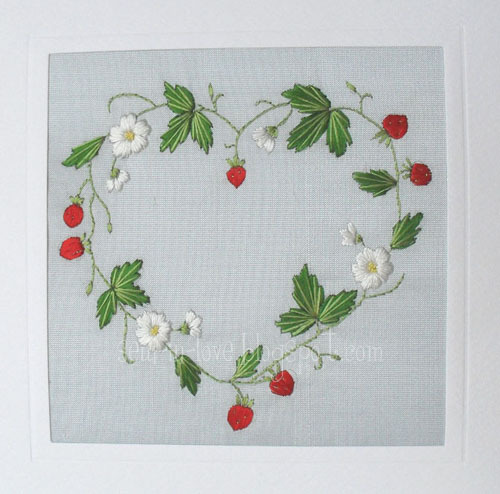 What are your favourite styles of embroidery? 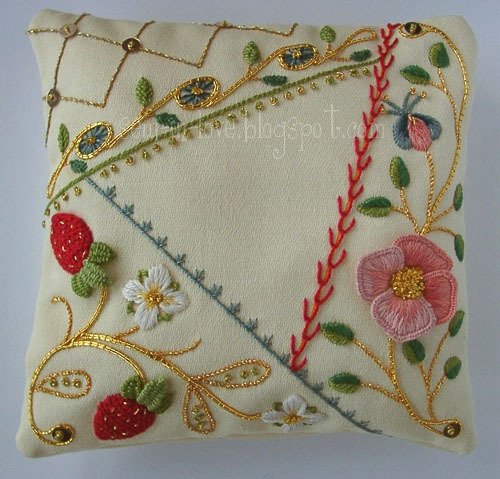 I love stumpwork and anything with a dimensional aspect. 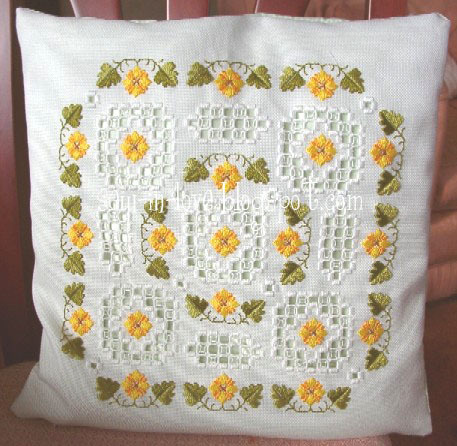 I also enjoy small pieces of simple ribbon work (dimensional again) and also sometimes just enjoy relaxing with a relatively simple technique like cross stitch – which is often great for creating pictures. Most things really! 7. 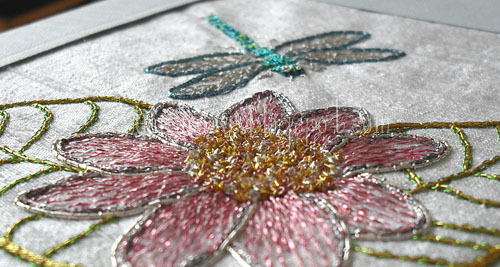 How many hours a day do you give to your embroidery? That’s a difficult question to answer as it can range from none at all to three or more. It depends on how I’m feeling, how much I’m enjoying what I’m working on (I can get ‘stuck’ for quite a while when I find a piece rather more a nuisance than a pleasure to work), when it’s needed for and also what else is going on in life – from being busy with other commitments to finding other things more interesting at any given time. So really, there’s no average time per day, or even per week. Sometimes a week or more can pass without my touching a needle and other times I’m stitching avidly every day. Lots! I’ve recently got quite into knitting and plan to take up crochet too soon. I also love reading and have several books on many topics on the go at any one time. Just now I’m reading two different Bible translations, the mammoth 18th century novel ‘Clarissa’, a book on the relatedness of Western European languages and how to exploit that in learning them, and a 1930s kid’s school story, to say nothing of several study texts - sciences, Chinese, German, Spanish, linguistics, English studies etc! I also love to travel and use my languages, but we rarely find the funds for that these days. 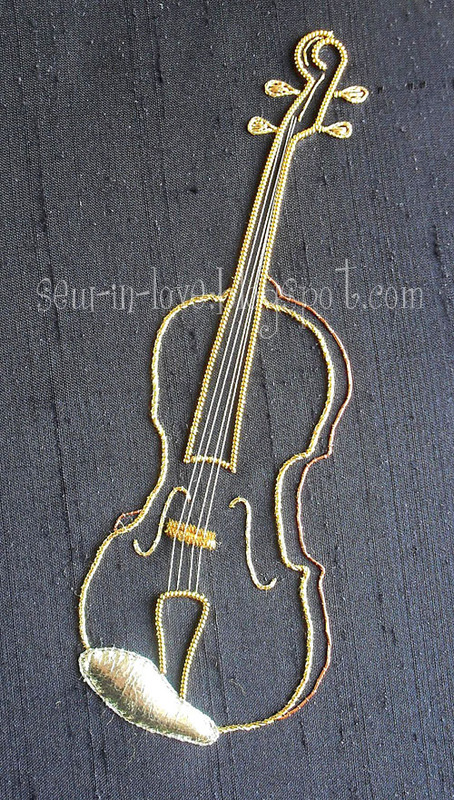 I’m keen on music too and have fits and starts of trying to learn to play the viola (which I also did a goldwork piece of). I’m not having lessons just now so it’s hard to stay motivated and I also enjoy paper-based arts and have recently blown all my ‘pocket money’ on some good quality watercolours and oil pastels. I hope you enjoy reading about Elizabeth and be sure to go check out her blog. Thanks for participating, Elizabeth! The ezine &Stitches has just published their 4th edition and have been kind enough to feature me this month! There are lots of great photos and projects and eye candy in this issue so go check it out!! Just click here to visit their blog with information. A big thanks to Nicole and Carina for their work putting this together. I'm busy, busy this week working to get my art exhibit project done. The exhibit opens November 3rd and is in Brigham City, Utah. If you just happen to be in the neighborhood, you should definitely stop by. The local quilt guild is hosting this, so there will likely be many quilts, but I know they are taking other types of artwork too, including this embroidery. Halloween is not the theme!! I will say more about this when the time comes. Here I am with this past month's embroidery journal project! This project was inspired by the maple outside the living room window. I often sit near this window where you can see the afternoon sun shining through the trees. So this represents one of the branches that hang down, filled with leave turning all sorts of beautiful shades of red, orange, and yellow. I painted the background with watercolors. I was happy with the way it looked. I wanted to have the feeling of the autumn sun lighting up the leaves. For this project, I just started with an idea, I didn't make a pattern or any lines on the fabric. I picked out a few threads that I thought might be interesting to use, and among those I had the brown threads I picked up at the flea market. It's a bunch of very thin threads all twisted together. No idea what the thread is for, maybe weaving, but it made a great branch. I couched them down and left the ends loose to give the feeling of even smaller branches. This one was fun! I'm off now to go out in the fall sunshine in search of my next project inspiration! I just finished this little doll yesterday. I consider the doll finished, but the project isn't. But my friend Starr was chomping at the bit for a look at her. So here she is. With her treat bucket, broom and crystal hanging from her belt, she is ready for action!! I've been meaning to try a little doll for ages, so finally, I thought it's time to do this. Making dolls is a fun change. While constructing this one I remembered how many little things needed for this type of project. I enjoy looking for different ways to solve the problems. This doll has a needle felted head. Actually she looked a lot scarier before I put the features and the hair on. Now she just looks like a nice, little witch, but very serious about this Halloween business! My intention is to make a background for her to be attached to. I hope to work on that soon, but first a couple other things get attention, like my September Journal project. It's coming and will be done soon!